So, are you looking to buy your first harmonica? this guide should help you understand the difference between a diatonic, chromatic and tremolo, and help you select your first harmonica (otherwise known as the ‘Mouth Organ’). These are the most commonly used harmonicas, and you will find them in blues, folk and often pop music. They are designed to play in a specific key. Nevertheless with different and specific “overblowing” techniques some players have learnt to play them in unofficial keys. It is worth looking for Carlos Del Junco or Howard Levy, they have both created a very good overblowing technique. Known as playing chromatically on a 10-key diatonic harp. As already suggested, most music teachers will advise you to get a diatonic (10-key) harmonica in the key C, as your first harmonica. Due to the larger reeds, it is harder to bend and overblow in comparison to the diatonic. Toots Thielmans and Stevie Wonder were well known to be proficient. Chromatic harmonicas usually come in the key of C or G, however you can learn to play nearly any music that uses the standard 12-tone scale. 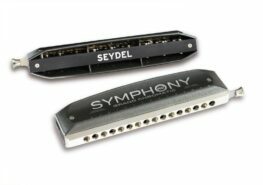 The distinguishing feature of the tremolo-tuned harmonica’s is that it has two reeds per note, with one slightly sharp and the other slightly flat. It is this that helps them produce a unique warbling sound. You will find the diatonic version in folk music, however the chromatic counterpart is usually found in Asian rock and pop music. Our store has huge ranges of different harmonicas, however we also stock amps, mics and books that can help get you started. Do not be daunted by selecting your first harmonica, and if you require lessons, or want to learn how to play, then we have a tutor on hand to teach you via Skype sessions. Director and joint owner of The Harmonica Company.